Handi-Shims are a revolutionary way of shimming, spacing, plumbing and leveling. They are available in four sizes; 1/32" (green), 1/16" (red), 1/8" (white), and 1/4" (blue). Click on the six slideshow icons below to view more product demonstration photos. Note that Handi-Shims are supplied coupled, meaning that Handi-Shims are manufactured as two shims connected at their non-beveled ends to provide convenient, double-length, flat-support installation for deep applications. For normal applications, the shims can be separated and, for particularly small spaces, are scored to be divided into even smaller pieces. A single Handi-Shim measures 1¾ inches square; the coupled pair measures 3½ by 1¾. Click here to view compression test results. 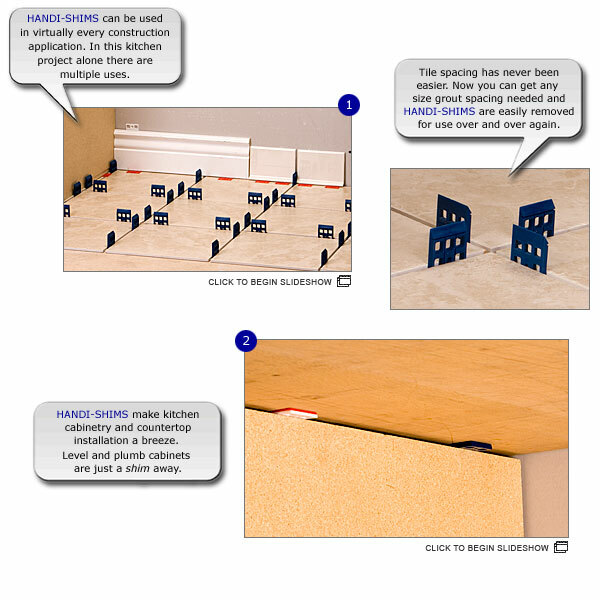 Spacing - Required for movement in plywood sheathing, Handi-Shims will help you achieve that required space. They can be placed on the floor to keep materials such as sheet rock, plywood, wood panels and concrete board from touching a damp floor. Installing a basement ceiling? Use a Handi-Shim to space pipes from ceiling joists while waiting for sheet rock to be installed at a later date. Scribing - Can be done in confidence knowing your exact size Handi-Shim will always create a perfect scribe. 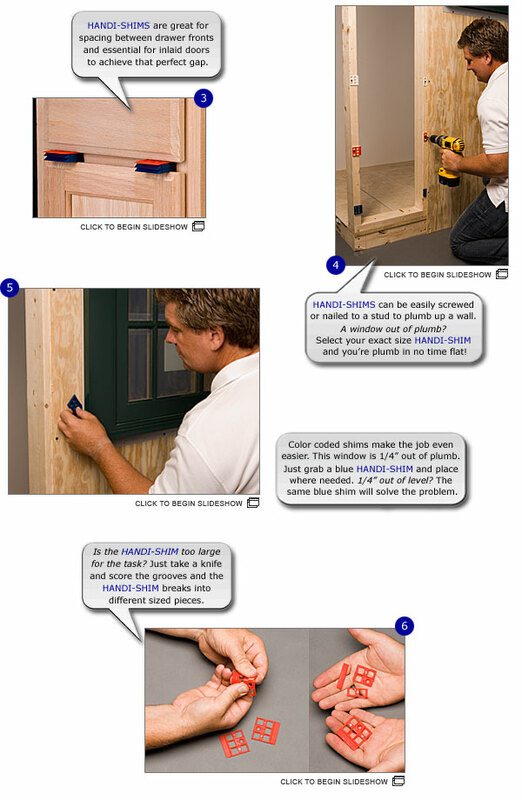 Leveling - When working with hinges, simply place a Handi-Shim under the door to give you the desired height, allowing you to cut in your hinges with ease. The 1/32" shim can also be used behind the hinges if needed. Masonry - Handi-Shims can be used in the building of stone walls. By placing a shim between the stones as you construct the wall, it will aide in keeping the stones from pushing out the cement between the stones as more weight is applied. They can also be used for equal spacing of paving stones. These are nearly a fraction of the uses tried and tested for the multi-versatile Handi-Shim. How will you use your Handi-Shims?